The Top 80 engine is made to use a semi-synthetic 2-stroke oil mixed at 2% (50:1) or a fully synthetic oil at a leaner ratio of 1.5 - 1.7%. See our Fuel Tips page for more information about what fuel to use. Failure to mix the proper 2-Stroke Oil with your fuel even once will cause your engine to seize and void the warranty of your machine! To prime the motor, position your finger over the Primer Spring on the Propeller side of the Carburetor, then blow into the Priming Tube attached to the Fuel Tank. As you pressurize the Tank, gently press the Primer Spring until you can see fuel reach the Carburetor via the clear Fuel Tubing. Allow 1-2 seconds of fuel into the Carburetor, and then release the Primer Spring before you release the blowing pressure into the Tank. If you release the Tank pressure first, the fuel can drop back from the Carburetor and air can re-enter the Fuel Line. Please be sure that all Fuel Caps are on straight and are seated to keep air from leaking from the Fuel System during the priming process. The Priming Tube also allows air to enter the Fuel Tank as fuel is used during flight. If you started the engine recently and it has not been transported over bumps, etc., you will not need to prime the engine again. You will need to choke it until you hear it turn over on it's own, but if you prime it again, chances are you will flood it. See Flooded Engine below to rectify this. 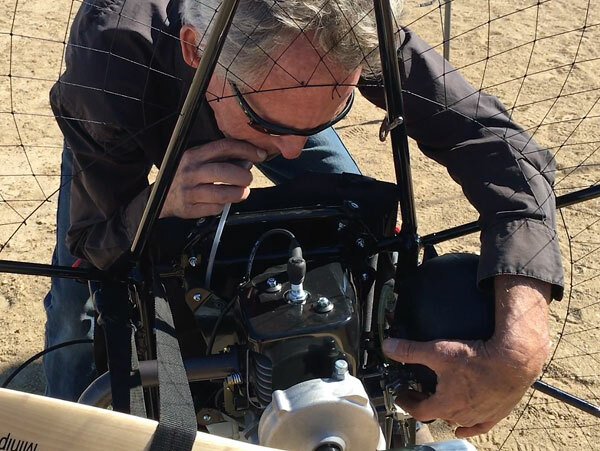 For another great description of how to prime your Top 80 engine, have a look at this link at Southwest Airsports: Priming & Starting the Engine. Whenever you start ANY Paramotor, you MUST be very careful to ensure that the Paramotor Frame is securely fastened to a solid Paramotor Carrier, Trailer Hitch Rack, leaned securely against some kind of restraint or on your back where it cannot get away from you should the throttle accelerate or stick unexpectedly. THIS IS THE MOST COMMON ACCIDENT IN PARAMOTORING - DO NOT WAIVER IN YOUR COMMITTMENT TO ADHERE TO THESE STEPS!!! Choke the Top 80 Engine using the Remote Choke located on the right side behind the pilot below the Carburetor. Pull the Starter Handle gently until it catches. You may need to give it a gentle "flick" for the pawls to catch. DO NOT pull hard when the Starter is not engaged! This will damage the Starter Pawls and void the warranty. Once you have the pressure, pull the Starter handle quickly and firmly through 2 revolutions of the engine. DO NOT pull the Starter to the end of its cord, this will damage the Starter Spring and void the warranty. Once the engine turns over with the choke engaged, it will only run for 1-2 seconds. Let the engine die, then stop the choke. DO NOT stop the choke with the engine running, or you risk allowing the engine to rev to full power! Now put the Paramotor on your back and start the engine and begin the warm-up (no longer than 1-2 minutes is necessary). If the engine does not start within 5 pulls, it has not been primed properly. It either needs more fuel, or is flooded with too much fuel. If it is flooded, remove the spark plug and observe whether the plug is wet. If it is, let the plug and cylinder dry out a bit before replacing the plug. DO NOT pull the starter while the Spark Plug is out or damage will occur! Another way to start a flooded engine is to enlist the help of another person to help you hold the FRAME of your paramotor as you hold the throttle on FULL (ready to ease off when it turns over), and pull the starter. It may take 6-8 pulls to bring the motor to life, as you are pushing the excess fuel out of the cylinder with this method. You will also notice a smoky exhaust as the engine starts fromn the excess fuel/oil mixture. Run the engine for a few minutes at different RPM's to clean out the system. The next step is to Break-In your Motor.